Phil Younghusband's milestone 50th international career goal couldn't have had a better ramification: it sent the Philippine Azkals to the country's first-ever appearance in the prestigious Asian Cup. The national team had to rally on Tuesday night to win against Tajikistan, 2-1, and qualify for next year's edition of the biggest football tournament in Asia. Kevin Ingreso atoned for an earlier foul by tying the match for the locals, which paved the way for Younghusband's deciding moment. An anxious home crowd in the jampacked Rizal Stadium (4,671 in attendance) went wild after the historical penalty conversion. 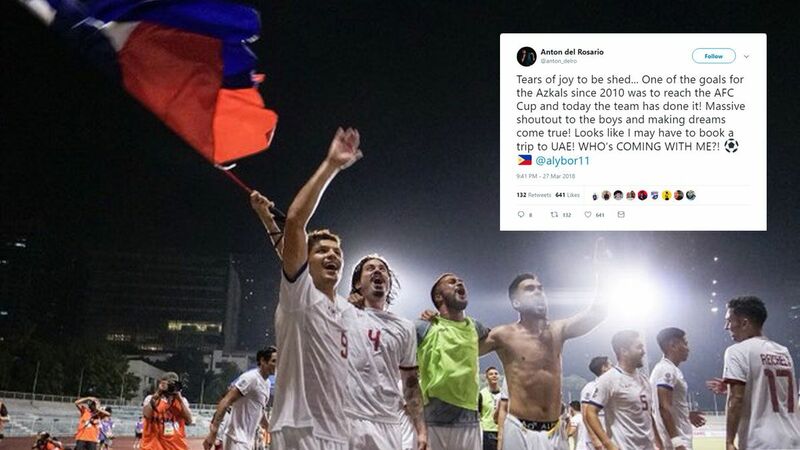 Those watching from the comfort of their own homes also joined it the revelry via social media, with Azkals sitting on top of Twitter's trending topics. Former and current members of the PH football team can't help but get emotional following the landmark victory. Sports scribes, both international and local, shared the same sentiment about the Azkals finally making it. Even the most prominent personalities were reduced to being a fan when Younghusband scored the winning goal. Congratulation and good luck again, Azkals!